Polycom's impressive new videoconferencing solution brings yet another Star Trek technology to life. If you’ve read my blog over the years, it should be easy to surmise that I’m a big fan of the TV show Star Trek. Given that the show was filmed in the 60s, the amount of technology it portrayed that has become a reality is remarkable. The show had voice-activated computers, and now we have Siri. It had immersive video, we have telepresence. It had communicators, we have push-to-talk phones. The list goes on and on. While I’m still waiting for warp drive, today at an event in New York, Polycom unveiled a new video solution called Centro that was designed to improve the effectiveness of meeting rooms. While the solutions aren’t identical (see the images bleow), the goal is the same – to enable workers in a physical meeting space to interact more naturally with one another. Traditional room-based systems are mounted on the wall, and that’s certainly effective for smaller meetings and one-on-one interactions, but it isn’t so great for teams collaborating with one another. The main problem with the systems mounted on the wall is that everyone in the room needs to sit at one end in a line and look at the people on the other side sitting in similar line. This configuration enables people in one room to maintain eye contact with people on the far side, but interacting with people in the same room requires constant moving back and forth to see the individual. Picture when four people go to a bar, they try and get the corner so everyone can see and interact with each other, whereas sitting in a line normally creates two two-person conversations. The other choice is to have people in the room sit across the table from each other so they can easily interact with each other, but that leads to the far end participants looking at the sides of people’s heads. So what’s the solution to the room collaboration problems? Well, that would be Centro (and in the future, Star Trek room video). If you look at Centro, it’s a four-sided solution that’s designed to be placed at the center of a room. It includes 360-dgree voice and video technology that automatically tracks the speaker while showing the entire meeting space on the screen. 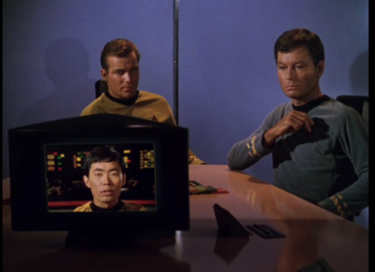 The Star Trek example I showed was from the episode called “Charlie-X,” where Kirk, McCoy, Spock, and Sulu were discussing what to do with the troubled youth the Enterprise picked up from the Antares. You can’t see Spock, but he’s on the other side of the table. The configuration in Kirk’s briefing room allows all of the participants to easily collaborate with one another without having to adjust to the limitations of the technology. Similarly with Centro, all of the participants can maintain eye contact with everyone else no matter where they are located in the room. The Enterprise’s system is enabled using voice commands, and while Centro isn’t there yet, Polycom did put a significant amount of work into making the user interface so easy that anyone can start a meeting without any IT (or Vulcan) support. One feature that Centro has that the Enterprise doesn’t is that Polycom included wireless pairing and proximity sensors to allow workers to integrate mobile devices into the collaborative session. Centro is a new way of deploying video into a meeting space and should enable Polycom customers to collaborate in a much more natural way than with traditional technology. While thwarting evil space entities is an obvious use case for Centro, businesses should be able to use the technology to improve any process where agile workers need to interact with one another and get stuff done quickly.